High Stakes testing is nothing new to the world of education, but the pressure on children has shifted greatly in recent years. Tears, anxiety, and lack of passion for learning is the new norm thanks to hours spent getting ready for these tests. 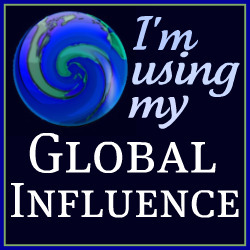 As an educator, I never thought I would go against the powers that be, but I did last year. That’s right, last year I was one of the many parents across New York that decided to refuse the NYS Language Arts, Math, and Science test for my then fourth grade son. It was a personal decision for us at the time to go against the grain and be one of very few in our area to do this. 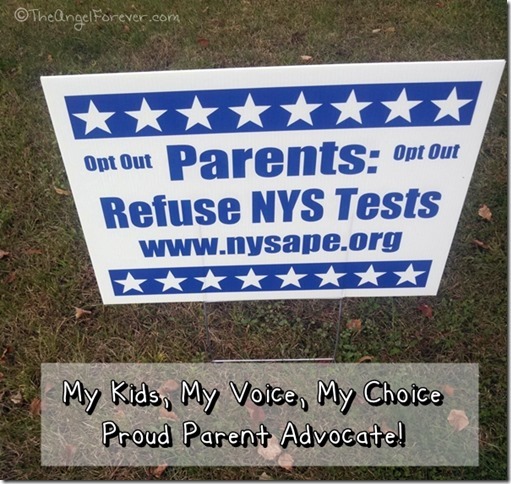 While the Opt-Out Movement was huge in Long Island and Buffalo region, the Capital District has been slow to grab hold. The reality is that high stakes testing is just part of the horror that is happening in our schools thanks to the shift to Common Core. 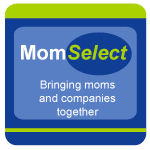 TechyDad and I knew that the tests were not going to be a good experience for our son. He would likely do very well, but the stress from practice testing was causing uncalled for levels of anxiety. I was questioned by administration. I was told it would hurt the school (funding), his teacher (APPR), and beyond. Thank goodness I knew what to expect. I was ready to combat the propaganda that was tossed at districts from the New York State Department of Education. On Friday, I sent my letter in to refuse the NYS Math and ELA exam and all field testing for my son. This was just about a month before the exams are to be given to children in grades 3-8. Once again, I am confident in our decision. The tests do not help teachers or parents to know academic growth or problem areas of children. Why? The answer is simple, we are not allowed to see the tests or analyze them to see spots that apparently caused the kids problems. Basically, they are secretive and made by a company that makes an obscene amount of money off of the world of education. This year, many more families are expected to refuse the tests not only in New York, but throughout the United States. 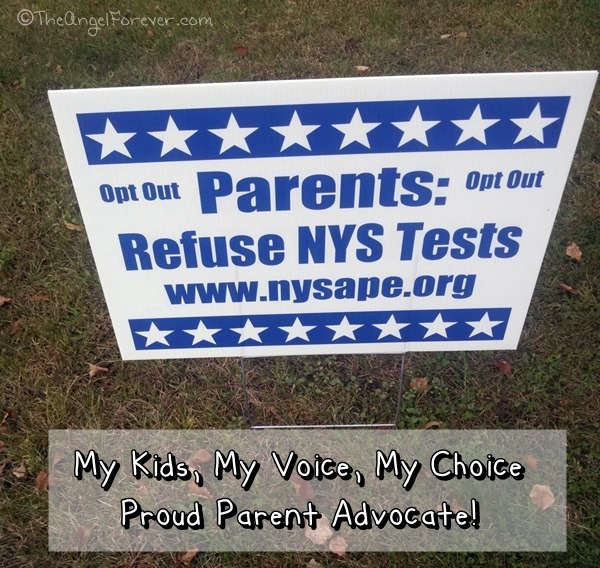 Thanks to the NYS Allies for Public Education the word is getting out that parents have the right to “Choose to Refuse” in New York. This video made by NYSAPE is a fantastic resource and must watch so you know the rights for your children. For too many years, we have been taught to blindly trust those in charge of the world of education. Right now, families across the nation and New York are standing up and saying that enough is enough. 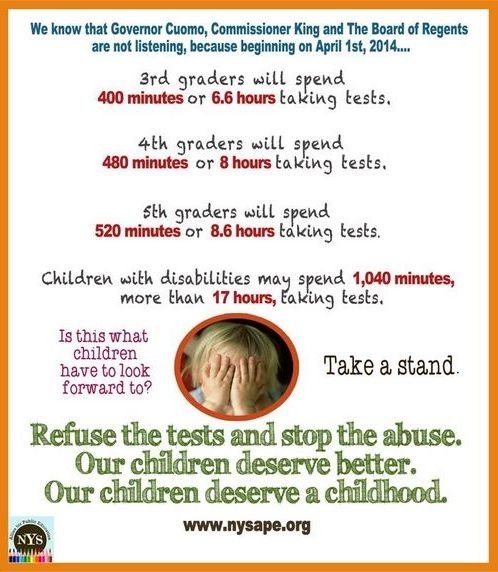 We are not going to sit back and let this testing madness continue. Our children deserve a proper public school education like past generations. If we don’t stand up and fight, the victims will be our kids who have already suffered enough in recent years.